Samuel Engineering and Bonfiglioli USA have completed the first floating array solar facility in Colorado, and the results have been positive, with Samuel Engineering pleased with the payback. Floating arrays may be old hat in Europe and Japan but in the U.S., they are less common. 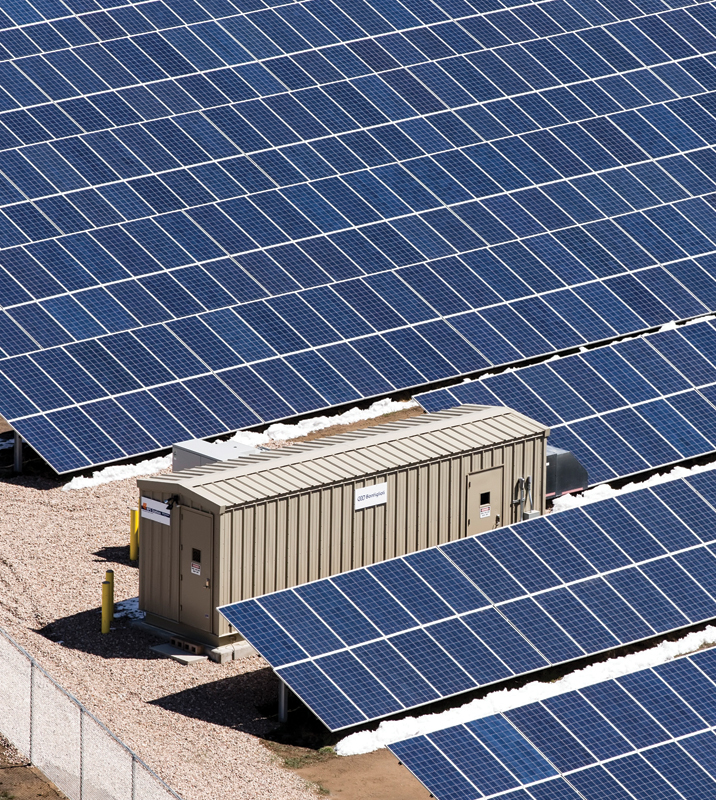 Samuel Engineering and Bonfiglioli USA have helped change that, however, by bringing the first such project to Colorado—the 2.28 MW PV Brighton Solar Energy Project, a ground-mounted solar energy plant. The project started back in 2011 under a different developer, and Samuel Engineering came on board after the permitting was completed. David Thorn, Samuel Engineering's project engineer, says this is typical with a lot of projects. "It often relies on financing and who wants to go ahead and continue the project. It was brought to us in the summer of 2012. We liked this project because it was a nice size, the PPA was OK, and it was in our own backyard." The project is only a 40-minute drive from the Denver Technology Center where Samuel Engineering, an EPCM (Engineering Procurement and Construction Management) company is headquartered. One of the challenges of the project was the complex financial aspect. "In order to make it work, it had to have a decent PPA with acceptable tax benefits, such as accelerated depreciation and the federal investment tax credit (ITC)," says Thorn. Once that was in order and Samuel Engineering looked at various scenarios, it purchased the project. To say this project was completed quickly would be like saying the Grand Canyon is rather large. The company completed it in just 70 days. "We got on the field September 26, 2012, and we were fully commissioned by December 5," says Thorn. 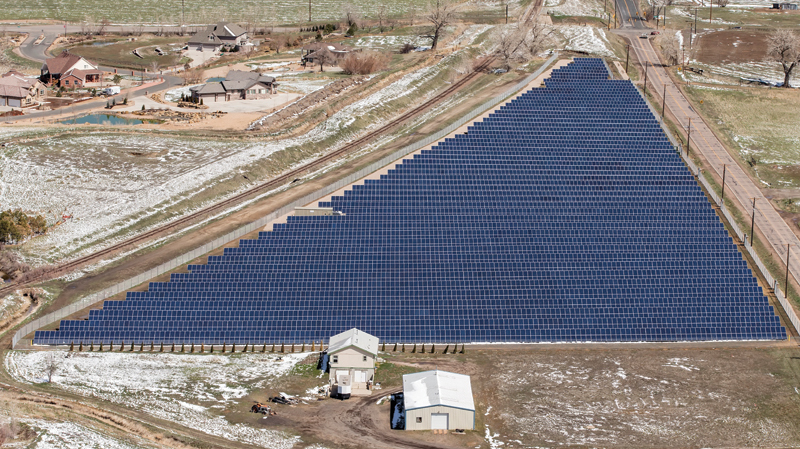 This timeline is even more incredible considering topography challenges and that Samuel Engineering wanted to use a different application of PV technology for the first time in Colorado. Samuel Engineering wanted to use a 1000V floating array system versus a 600V grounded array. Although popular in Europe and Japan, there were few of them in the U.S. in 2012. "They're becoming more common now, but we were one of the first, especially in Colorado, doing it," says Thorn. To make it happen, Samuel Engineering went to Bonfiglioli USA. "The initial interest in the Bonfiglioli inverters was because the UL listing at 1000V was going to be critical for this project. In the end, Bonfiglioli was selected because of the three pillars of project management: cost, schedule, and performance," says Thorn. "The centrally located, modular inverter design allowed us to take advantage of the production and maintenance benefits of a distributed system, and at the same time, profit from the considerable lower capital cost and ease of maintenance of a central system." He adds, "Having the array be ungrounded and at a higher voltage decreased both capital costs and energy losses. Bonfiglioli USA went above and beyond in providing customer service, technical support, and most importantly, on time delivery." Another challenge was the topography. A square plot is ideal, but that wasn't the case with the Brighton Solar Energy Project. The ET 300W solar panels (chosen because of how well they performed in laboratory testing) were installed on a triangular nine-acre site, with the western side curved to follow a railroad track. Samuel Engineering had to work around easements and access rights to a 100-year-old ditch. This made it difficult to maximize the land and at the same time maintain string sizing. "In our case, 19 panels was the string size, so we had to cross rows with the string, which is also another thing not typically done, but we did that in order to maximize the land space," says Thorn. "We became very adept at maximizing the land for a very odd shaped plot." Italy-based Bonfiglioli could have provided inverters for floating arrays years ago, but the U.S. had some catching up to do. It wasn't until the changes put forth in NEC 2011 that floating arrays really became a viable option. Even once the code allowed for it, it still took inspectors time to get comfortable with it. Thorn says they were lucky. "The State of Colorado was great to work with. We just explained what we were doing, demonstrated that it was within the code, and they went along—which is not always the case in some jurisdictions." All fast track projects come with some stresses. One stress was working through variances with the planning commission. "We already had permits, but many issues still had to be revisited with Adams County," says Thorn. Another challenge was the UL testing. "This project's inverters were Bonfiglioli's first two units to go through UL testing, which was pushed back," says Thorn. "Bonfiglioli was still able to make the dates that we needed, but we were down to watching the truck drive from Canada all the way here to make sure that it was on time because we already had cranes coming to be on site." In the end, it's a team effort, he says. "You need to have a design team and then your subcontractors lined up well, and they have to be able to work with some flexibility in order to make all of those things happen on time." One would think snow on the panels might be a problem in Colorado, but it's the temperature that is a bigger issue. "We have clear blue skies that range from 100 degrees in the summer to -10 Fahrenheit in the winter, so the solar panels get very high open circuit voltage. Being able to balance that and then balance the amount of DC wattage that you pair up with the inverters, and then picking the best inverters for the particular project becomes a good part science and a little part art form to be able to maximize your yield for your capital cost." With the Brighton Energy Solar Project, Thorn did the sizing and modeling and then took it to Everod Samuel, who is both an electrical engineer and president of Samuel Engineering. "I probably ran 20 or 30 different design and financial models to try and optimize the project," says Thorn. "We were still tweaking and making small changes through the beginning of October." Another unique aspect of the project is that there are two sub-arrays, each with different tile angles. "One sub-array is to maximize a natural slope in the terrain, and the other we did to get to the density that we wanted," says Thorn. The decision for sub-arrays was made in part because Samuel Engineering would be doing the O&M after the project was completed. Normally as an EPCN firm, they hand the keys over to the client at commissions. "In this case, it made better financial sense for us to own and operate this for a while, and it is good data gathering for us to learn things so we can add more value to future clients." If Thorn could change anything, he would have liked to have been a little more involved in the shaping of the permitting requirements. One thing he would have liked to change was the use of evergreen trees in the landscaping. The trees that were selected shade a portion of the solar facility and will be even more of an issue as they mature. "We monitor at the string level with a web-based application. I can look at the map and see the time of day and track the elevation of the sun, and I know exactly which strings are being blocked. You see a string come fully online and then the next string goes down and watch as the shade from the trees blocks those strings." Things like that, however, are just part of doing business when you come in later. "The challenge is trying to satisfy all of the requirements and still meet or exceed your production goals," he says. Now that it's been nearly a year, and the facility is operating at or above expectations, no one is complaining. Although they don't want to share the exact figures, the company is pleased with the payback. "If there's anything with solar development that still needs to be improved upon, it's probably the financing side, especially with government subsidies and the federal ITC expiring in 2016," says Thorn. "I think people are going to have to become better at pulling in interested parties and making it work financially for everybody—large commercial energy users, the utilities, and also the person that's going to build and own it." Thorn isn't solar centric. "My personal opinion is that even though we did solar here, each region needs to do what makes the most sense for them. We should build wind generation where it's windy, solar where it's sunny. I don't think you should try and force one or the other." He adds, "Government should be used in order to develop new technologies, but sooner or later there needs to be a sundown plan of those subsidies and then let it stand on its own two feet." Through the ambitious teamwork of companies like Samuel Engineering and Bonfiglioli USA, with the introduction of technologies that improve performance and lower capital costs, that could soon be a reality.